Gunmen from a Christian sect have stormed a prison in the Democratic Republic of Congo’s capital, freeing their leader and about 50 other inmates, a government spokesman says. He was an MP when he was arrested in Kinshasa after police accused him of inciting violence. “Followers of the Bundu Dia Kongo attacked Makala prison at dawn and broke out around 50 prisoners including their guru, Ne Muanda Nsemi,” government spokesman Lambert Mende said, AFP news agency reports. 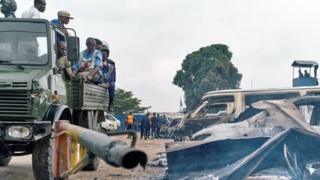 A major operation is underway in Kinshasa to recapture the prisoners, reports the BBC’s Mbelechi Msoshi from the city.